We’ve all had a time in which, for whatever reason, we didn’t check out that one landmark work when it was released. Maybe you were too busy at the time and forgot about it until years later. Perhaps you weren’t in the mood to see what it had to offer. It could’ve even resulted from the decidedly strict limitation of not having been born yet. Whatever the case may be, I’m positive we’ve all had that experience in which we didn’t get into a work months, years, or even decades after the fact… sometimes to our detriment. Ever hear the phrase “You had to be there”? I feel that applies to certain works out there. It’s not to say they haven’t held up well, but for a lot of them, you miss out on a certain something by getting into them after the fact. A lot of people argue this is true of music, but in all honesty, I don’t quite believe that to be the case. It’s true that what a big deal some defining albums were may be lost on later generations, but each era manages to be good in ways later ones couldn’t fully replicate. Indeed, what I believe is the medium’s greatest strength is that its artists find ways to be good on their own terms. They may take inspiration from their predecessors, but they tend to go in new directions with their own work. This means that the newer artists could claim to be more technically skilled, yet the older artists’ efforts aren’t invalidated. At the end of the day, the best artists of each generation made music people still want to listen to all these years later, proving the extent of their staying power. I also don’t think I’ve ever had this experience with films, but one I can think of that would be subject to this phenomenon is Avatar. This film was an incredible technical achievement for its time, but a lot of that is lost attempting to watch it at home on a small screen. At that point, the hypothetical viewer would only judge the film based on its writing and characterization, of which it comes up short on both accounts. Having followed up the similarly subpar District 9, Avatar continued science fiction’s poor showing in 2009. In the end, it managed to impress critics by placing more of an emphasis on style over substance. The film then proceeded to generate an incredible amount of money in the box office only to have little impact on pop culture. As a result, I feel that had I not seen the film when it came out, I would’ve reached my current stance on it much faster. When it comes to video games, on the other hand, I can think of a few examples. The first one that springs to mind is Castlevania: Symphony of the Night. I want to make it perfectly clear that I don’t think it’s a bad game – far from it. It’s just that a lot of people consider it one of the greatest games ever made when I just found it to be merely good. I think what didn’t help is that by the time I finally got around to completing Symphony of the Night in 2014, I had already played Dark Souls, which I consider to be a superior take on the Metroidvania formula. Even discounting having played Dark Souls before finishing it, my first attempts at playing Symphony of the Night in 2009 resulted in me being uninterested in seeing it through. By then, I had played Portrait of Ruin, which I feel had a better interface, though it was probably worse as an actual Metroidvania. 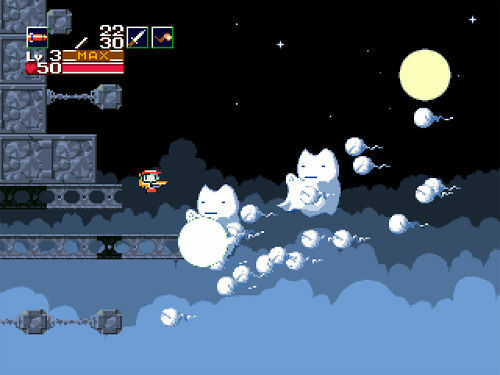 Another example I can think of is Cave Story. When this game was making the rounds on the internet in the 2000s, it was huge. Practically no other independent effort felt like a cohesive, fully fledged experience that a professional developer could have made – and this was created entirely by one person from scratch. Indeed, I feel a lot of the credit Braid gets as a turning point for independent gaming should be attributed to Cave Story instead. That being said, when I played Cave Story in 2010, I wasn’t terribly impressed. I hadn’t experienced that many independent efforts at the time, but the strange physics engine and occasionally unintuitive gameplay wound up throwing me for a loop. I probably would’ve been more willing to overlook the flaws had I played it when it was first starting to achieve popularity, but by 2010, I wasn’t. A lot of people insist that the lack of polish gave independent games from the 2000s/early 2010s charm, but while the AAA industry ended up adopting a lot of questionable design choices over the years, remembering to polish their gameplay isn’t one of them. One last example that stands out to me is BioShock. Despite what most fans of Ken Levine’s work insist, I still believe it to be a superior effort to System Shock 2, but while it’s touted as one of the greatest storytelling experiences the medium has to offer, I didn’t feel that way when I played it in 2013. At the end of the day, it feels like they just crammed a satire into a first-person shooter without making sure it actually benefited from being in a game. Considering other storytelling efforts such as Nine Hours, Nine Persons, Nine Doors managed to find ways to experiment with the medium to a greater effect, the divide between story and gameplay is jarring in hindsight. 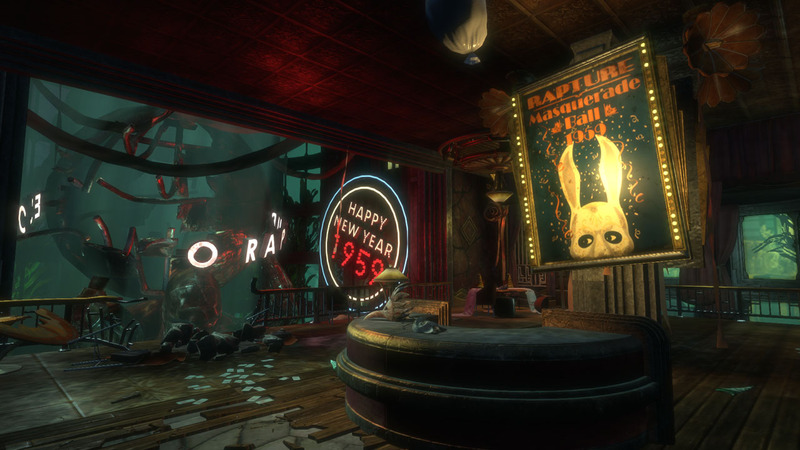 Granted, I do still give BioShock credit for remembering to be a game most of the time, which is more than what could be said of later AAA efforts such as Spec Ops: The Line and a fair chunk of Naughty Dog’s output that all try and fail to be films – often at inopportune moments. So while BioShock has a tendency to appear on many “Greatest games of all time” lists, I merely think it’s pretty good. Do you feel as though getting into certain works late caused you to think less of them due to having missed their initial impact? I’ve picked up Cave Story+ for the Switch recently – I abandoned it on Steam because the control system was so dodgy. Enjoying it so far, and I believe the story is meant to leave a big impact, but it’s not super amazing. However, way above Braid which I picked up and abandoned very rapidly. For other stuff, I only watched the Last Jedi the other week. I’ve not really played GTA V much either, which is very late to the party. I myself originally played the Wii version, so I wonder if the Switch version may have improved the controls a bit. Making precise jumps could be quite irritating. I too heard the story was meant to leave a huge emotional impact going into it, but in all honesty, that never happened with me. It’s a decent story, but nothing spectacular. It is indeed a cut above Braid, however. Having a comprehensible narrative counts for a lot, it seems. Yeah, it’ll be interesting to see how these new Star Wars films will hold up once the buzz has worn off. Truth be told, I haven’t gotten around to playing a GTA game. Maybe I should change that soon. Now that’s intriguing! 🙂 I can’t think of an occasion for myself but certainly this happened to my friend with Destiny 1, except she liked it more rather than less. She’s someone who absolutely HATES games that “aren’t finished” so she never bought Destiny 1 due to the negative reviews upon launch (and to be honest… my own opinions on it). When Taken King was on sale (and included all the existing content) she finally got it and ended up loving it. She told me she didn’t understand the hate because it was “brilliant.” From her perspective she was playing a complete game but without the long wait I had and after the many changes Bungle made to how the game systems worked (Infusion and light levels etc). Yeah, that’s a major problem with releasing these games in an unfinished state. When the patches come out to finally resolve the problem, all future readers have to go on are the initial (negative) reviews, which would give them the wrong impression. It’s kind of like how Rotten Tomatoes can’t be relied on whenever the critics collectively fail to recognize a classic when it’s first released. I suppose coming into something after all the buzz has died down may well make it feel like less of a special experience. Or perhaps a player has had their expectations built up so much after hearing how amazing something is for the past 12 months, and the game simply can’t live up to that. Then there’s the potential for story spoilers and so forth. The only example for me I can think of off-hand is the remaster/remake/re-whatever of Shadow of the Colossus. I really did enjoy it, but it didn’t feel like the incredible experience I’d been lead to believe it was. This may have been due to spoilers over the years, or that the controls don’t hold up as well. I can’t really be sure. That is true, though there have been a few times in which something was hyped like crazy over the years and when I finally got around to it, it became one of my favorites as well. That’s what happened with Dark Souls. As I’ve said, I found that hype doesn’t really factor into what I ultimately think of a work. I have to agree with you on Shadow of the Colossus, to be honest. It’s considered one the absolute best games ever made, and though I think it manages to grasp something later art games didn’t (or in the case of Jonathan Blow with Braid and The Witness, couldn’t), I just found it to be very good. It’s definitely worthy of its following, but I couldn’t consider it the best of the best. Very much agree with Braid. I bounced off that fairly quickly, but again I was quite aware of why it was well regarded ahead of time. I did like The Witness though. It was quite satisfying, although the late games was stupidly difficult. When thinking about missing out on the anticipation and general excitement, I feel like The Wire and Breaking Bad were two that spring to mind. Breaking Bad was always being talked about when the final season was on air, so I picked it up and initially struggled to engage with it. After a few months, I picked it up again and absolutely loved it. The Wire was years before my time, so I was never able to access it on air. While the show is near flawless, the fact I didn’t have someone to talk to about it made me a little disappointed. As for games, Bayonetta 1 and 2 are the first that come to mind. For some peculiar reason, I passed on playing them both on Wii U and then bought them on Switch instead. I couldn’t believe I hadn’t purchased them sooner! Looking forward to reading everyone else’s experiences as this is a really interesting topic for discussion. Great article! I have a difficult time getting into television shows with ongoing narratives because I know there’s a chance they’ll totally go south in the last season. Being a stickler for endings, you can see why I’d have a problem with that. Having said that, I’ve heard many good things about The Wire and Breaking Bad and how they managed to be good from start to finish. I may have to try them out at some point. I’ve wanted to try out the Bayonetta games for some time, and now that a Switch port for the first is available, I’m even more interested. I’m similar in that I struggle to engage with ongoing, serialized drama simply because it starts to lose its way sooner or later (e.g. Lost, Walking Dead, even Game of Thrones at this point). That’s one of the reasons I adore anthology series like True Detective and Fargo so much, but sometimes it is good to watch those heralded as the very best in television drama. Both The Wire and Breaking Bad are excellent. If you ever do choose to watch them, I hope you enjoy! You defintely should! They’re so awesome – not to mention the eventual release of Bayonetta 3 for Switch. Weirdly, I’ve found that hype doesn’t play much of a factor in what I personally think of a work. The Last of Us and Undertale were both massively hyped when they were released, yet my reactions to them were completely different. I totally get why you’d do that though; I’ve always advocated enjoying things purely on one’s own terms. I’ve had experiences both ways with it. Twilight Princess comes to mind for one where I don’t get the love for it. I didn’t play it when it came out, instead first playing it when it released as an HD version, and it just didn’t mesh with me. On the reverse side, AC Unity, which was a broken mess at launch, I waited a year to play it and when I did, found it to be wonderfully enjoyable. I remember really liking Twilight Princess when it came out in 2006, though I kind of wonder if I’d like it as much if I were to do another playthrough of it. I remember thinking the boss fights were something else. Oh yeah, I heard plenty of horror stories about Assassin’s Creed Unity when it was first launched. If what you say is true, that would make it the Fallout 2 of its generation; a good game buried underneath poor coding. Definitely have to disagree with you on Symphony of the Night. I think it is definitely one of the best games ever (I can understand the argument that Dark Souls is a better Metroidvania, but personally, I think SotN trounces Super Metroid). And I was also someone who didn’t play it until much later (I ‘dipped my toes into it’ in 2007, and didn’t fully play it to 2012). Easily the best PSOne game, at any rate. I do, however, completely agree on Avatar. I actually saw it in theaters, and while there are far worse sci-fi movies out there, it really isn’t anything special…at all. And I think this is evidenced by the fact that, despite being the highest-grossing movie of all time, has had zero impact on popular culture. The Force Awakens was released six years later and seems to have already made a much bigger impact, as have Marvel movies, etc. I’m going to pull a seemingly odd choice for the game I was ‘late’ on and select Donkey Kong Country 2. Yes, I played it when it was released in 1995, but I was a kid, and couldn’t get over the fact that Donkey Kong wasn’t actually in it (by little kid logic, that constitutes a flaw). I enjoyed it, but never made it past the second world. It wasn’t until twelve years later in 2007 that I downloaded it on the Wii Virtual Console and played it the whole way through, realizing that I was missing out on possibly the best platformer ever. The gameplay, level design, atmosphere, and perfect, perfect soundtrack quickly ascended it to one of my all-time favorites. And it still is to this day. Oddly enough, in the interim between ’95 and ’07, I can remember DKC2 was my go-to game to rent at hotels while on vacation (yes, I can safely say I’m someone who only ever purchased retro games at hotels, as opposed to other options). I still never made it very far (what with the rental time limits), but it almost seems like those little tastes of the game were meant to be, and ultimately culminated in DKC2 becoming one of my favorites. Funnily enough, it was your review of Symphony of the Night and my own feelings on it that inspired this question. I can certainly see the appeal of the game, but to me, it never really rose above the level of being merely good. It was a worthwhile experience that is easy for me to recommend, but I have to admit I still feel Super Metroid is the superior game (though I don’t think the latter is the best game in that series either). I will say that as a PS1 game, it has held up better than the original Metal Gear Solid and it was an unfortunate victim of everyone’s fascination with 3D at the time (unlike Yoshi’s Story, which was deservedly ignored). The reason I thought of Avatar when answering this question is because I have the feeling that’s what I’d think of it if I saw it at home rather than in theaters. It should be noted that unlike the three games I mentioned, I feel Avatar is just flat-out bad. I think it’s fascinating how such a successful film could leave practically no impact on pop culture; whenever it is brought up, it only ever seems to be in the context of how underwhelming it is. Roger Ebert may have given it four stars, but I don’t see it having much longevity when push comes to shove. Meanwhile, The Avengers, which was released three years later, has had more of an obvious impact on pop culture. To this day I find it strange how A) Donkey Kong wasn’t a playable character in two of the Donkey Kong Country games and B) I’ve always preferred those two games over the first. Though I heard those aspects annoyed others, they never really bothered me as a kid for some reason. Even at that time, I realized that Donkey Kong Country 2 was a better game. It still stands as my favorite 2D platformer. I can’t say I’ve ever rented a game at a hotel. It’s mostly because I couldn’t be bothered to figure out how it worked but also because I had the tendency to bring my Game Boy/DS. I agree that arriving late to the party can, let’s say, disrupt one’s impression of a game. There are numerous titles that were excellent in the context in which they appeared but that, with time, aged poorly and lost that edge that had originally made them so fantastic. I have arrived late to a few parties in my gaming life. The best examples I can think of are all Zelda games released The Wind Waker. Given they often rely on being able to understand what characters are saying so one can follow the story and know where to go, playing A Link to the Past, Ocarina of Time, and Majora’s Mask when I was a kid was just an impossible task. I only got to enjoy them once I started learning English during the early 00s. But, in those cases, I can’t say being late to the party harmed my enjoyment, as those are titles that have aged quite gracefully. Yeah, for early 3D games, both Ocarina of Time and Majora’s Mask have aged very well. I think what helps is that the latter had a really avant-garde concept. I couldn’t imagine a game with such a concept getting funding in today’s AAA scene. Majora’s Mask in particular was a strange case with me in that for whatever reason, I didn’t fully get into it until several years after its release. It was only after I completed it for real that I fully appreciated what an incredible game it truly is. Majora’s Mask is quite unique, there’s no doubt about it. I wonder if Nintendo will ever do something so odd thematically with the Zelda franchise. I think it would go along nicely with the open world framework that Breath of the Wild has set up, and if Nintendo wanted the successor of that game to be different, going the Majora’s Mask way would certainly be an option. I think the only times I really felt like being late to the game on things was when they really relied on a social (or multiplayer, in the case of gaming) experience. I’ll usually shy away from games with multiplayer, for instance, if the hype train has already passed the station because I still remember days of getting into MMOs when they were on their last legs (Shin Megami Tensei Online being one of those examples) and feeling very little excitement due to not seeing many folks and having no one to hype out over it with. While I try really hard to ignore the ‘everyone else is playing/seeing this’ concept in favor of going to experience the things that genuinely excite me, I can say that there were a few times jumping in while everyone else was definitely was a benefit. My mind keeps going back to The Blair Witch Project and how without the media hype (and quite frankly genius marketing), I don’t think it would have been as great an experience. As someone who chronically waits for the sales once a game’s hype dies down or for a movie to get released onto Netflix, there aren’t a ton of things I feel like I’ve missed out on the experience of for this reason. It definitely brings up some ruminations on the subject, though! That is the problem whenever games have such an extensive interactive component; it becomes lost when you’re the only one playing it after a certain number of years have passed. That’s why I tend to review games based off of their single-player campaigns; that’s how works are granted staying power in the long run. I have to admit I missed most of the hype surrounding The Blair Witch Project; as a kid, I merely knew that it existed. I did hear its marketing campaign was something else, though. Economically speaking, that is probably the best way to handle it – waiting for games to drop in price before getting into them. If it’s a game I want to review, but know I’m probably not going to keep, my approach is to get it new and sell it on eBay afterwards. At that point, the difference is effectively a rental price. Symphony of the Night is probably one for me as well. I’ve loved a lot of the Castlevania games that came out since then. Dawn of Sorrow is one of the few games I put in the effort to 100%. 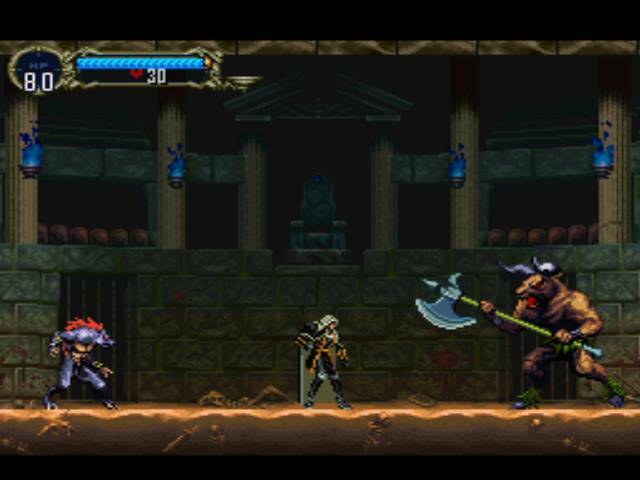 Playing Symphony of the Night, it’s good, but it didn’t blow me away as much as some of the later games did. Likewise, the Baldur’s Gate series and Planescape: Torment. Both highly revered. I despised Baldur’s Gate in particular, while Planescape: Torment, I loved the plot aspects of it, but they didn’t overcome the gameplay bits as they have for many others. And Devil May Cry. Completely innovative, yet by the time I came around to it, I had played so many games that advanced its formula far beyond it that it just seemed incredibly clunky and unfocused. Interestingly, I think I might have had the opposite experience with Final Fantasy XII. I disliked it when it first came out, but in the years since I’ve played games using similar battle systems that had a bit of a gentler introduction to the kind. When I came back to it recently, I found I’ve been enjoying it a lot more. Ah good, I’m glad I’m not the only one who felt that way of Symphony of the Night. As I said, I do think it’s a good game, but I wouldn’t rank it among the absolute best of the best. In addition to having a worse interface than that of Portrait of Ruin, I also wasn’t a fan of having to explore the castle a second time upside-down; it came across as padding. I completely agree with you on Baldur’s Gate. Having to save scum to get anywhere did not a good time make. I heard Final Fantasy XII was popular to hate when it was released, so it’s interesting getting into such a game after the heat it received died down. Similarly, I feel certain games such as Metal Gear Solid 2 and Apollo Justice were better to get into as latecomers than on release date. Anything that has timeless qualities will always remain great. Drawing inspiration from older works to make something new doesn’t make the older works less valid as you mentioned, if I am reading your article correctly. I think this is the right approach to creating potential masterpiece, although it is very risky, especially if money is involved. I certainly think that’s the case with music and, to a lesser extent, films. A lot of people go on about how older works in those mediums haven’t held up well because it’s so difficult to appreciate how innovative they were at the time, but more often than not, it suggests to me a mindset of someone who has trouble putting themselves in the perspective of the time in which it was released. Those older works tend to be good because they’re good in ways that can’t be replicated anymore, and if someone set out to do just that, they would have however many years of that work’s legacy to compete with. 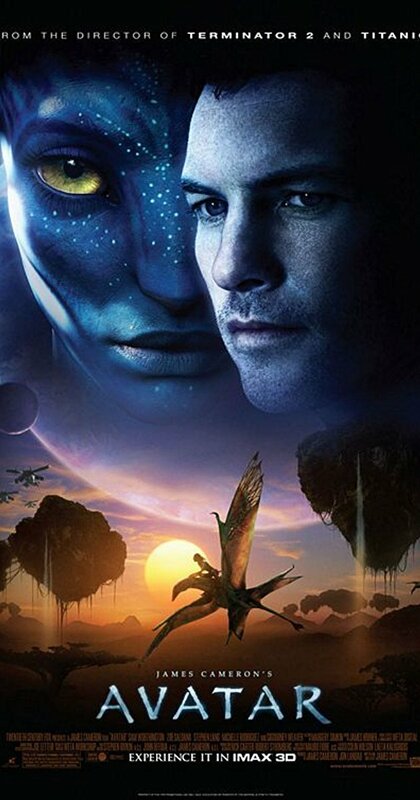 The reason I think Avatar was a case where this didn’t end up being true is because it sold itself primarily on the visuals, which basically ensured it had no staying power. Even someone attempting to put themselves in a 2009 mindset would have difficulty appreciating the film when the writing and characterization is so bland. Having said that, despite a lot of people insisting this is the case with video games, I would argue they’re the most susceptible to this phenomenon. It’s difficult to get into a lot of pioneering eighties games because many sensibilities from that era have been lost due to creators adopting better design practices – it’s to the point where one wonders how developments (such as having “W” “A” “S”, and “D” as the standard controls for FPSs) weren’t thought of sooner. Then of course there are the critics who have only worsened the problem by insisting that a highly promoted AAA effort is the best thing since sliced bread… at least until its sequel comes out and is somehow even better at being the best thing since sliced bread. Critics praised Uncharted 2 left and right back in 2009, yet when Dark Souls was released two years later, it had much more of an impact on the medium in a much shorter amount of time. Uncharted 2 is still considered a masterpiece, yet for all of its praise, not many developers have taken cues from it despite having a two-year headstart over Dark Souls (or if they have, they haven’t met the same level of critical success). With ongoing series and video games, it probably is a better idea to get into them later so you can get them all in a single box set/after a price drop. I try to keep up so I can take part in the conversation, though if I end up not liking the work, I just sell it on eBay afterwards and consider the difference a rental price. In an ongoing series especially, it’s nice to not have to wait for it to conclude. I remember anticipating those last Harry Potter books myself.